The 28-year-old Chelsea and Belgium playmaker — a pivotal figure in his country’s best ever performance at the World Cup finishing third last year — said Sarri’s approach is vastly different to those of his two previous managers at the London club Jose Mourinho and Antonio Conte. Sarri has had a mixed first season since arriving from Napoli, an abject 4-0 defeat to Bournemouth last month being perhaps the nadir. Chelsea are involved in a three-way dogfight — with Arsenal and a resurgent Manchester United — for the fourth and final Champions League spot. Hazard, though, is content with Sarri’s style. “Possession! Possession! The manager likes possession!” said Hazard, who spoke to The Times on a visit to a school for Chelsea Foundation talking about diversity and equality. “He’s a lot about statistics. Numbers. Possession. Shooting. Goal opportunity. “In the past we used to play more counterattack. “It is different with Sarri than with Conte and Mourinho. Hazard, who admits when he was a child he used to support France more than Belgium and wore a Zinedine Zidane shirt, is clear about his admiration for former banker Sarri. 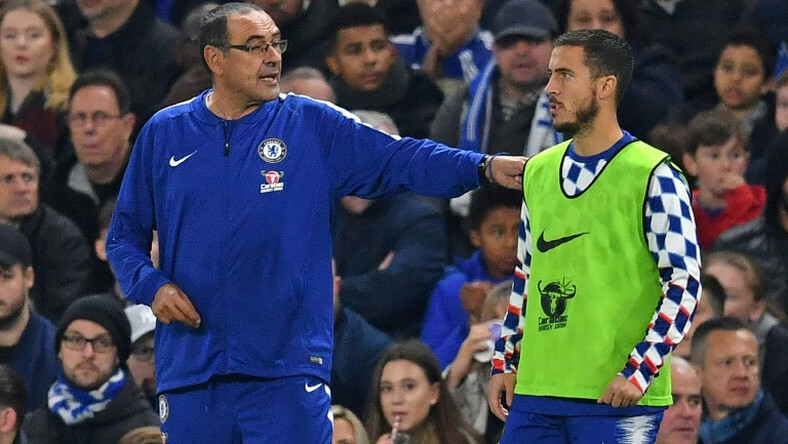 “Sarri is a great manager,” said Hazard of the 60-year-old coach. Hazard usually plays on the left now that Gonzalo Higuain has arrived to play central striker with either Pedro or Willian often on the other flank. Hazard, who says it is nice to be able to go to restaurants or the cinema with his wife Natacha and three children and not be approached the whole time, as he is in Belgium, is keen to emphasise his philosophy as a player is dedicated to the overall team performance. “In football, you can be at the top but in three months you can be nothing,” said Hazard, who has three younger bothers, all footballers. Hazard, who has been at Chelsea since joining from French Ligue 1 club Lille in 2012, admits there is a barrier to him becoming the best player in the world. “I’m not at all selfish,” he said. “The way I am can be a weakness to be the best player in the world. “Managers like Mourinho, Conte, now with Sarri want me to score 40, 50 goals a season but can I do that? “I’m not sure. Maybe they think I can, but I know myself and I don’t think I can. But I will try. “I like to be ‘the star’ but I like also when I can pass the ball to another for him to score, and it is not just about me. Hazard, who has won five trophies at Chelsea, including two Premier League titles and the Europa League, may be enjoying his football but there is one element which displeases him. The racist abuse by Chelsea fans of Manchester City’s Raheem Sterling and the Islamophobic remarks made to Liverpool’s Mohamed Salah by a West Ham supporter have been the focus of discussion among Chelsea players. “We respect everyone,” says Hazard. “Also when you see the Belgium squad we have a lot, of course, Belgian players but some from Congo like (Romelu) Lukaku, (Michy) Batshuayi and (Christian) Benteke.